Kymco is by and large known for its scooters and small-engine motorcycles. Here in the U.S. market, the company offers two motorcycles, the 150cc Spade and 125cc K-pipe. It also offers a brace of scooters, side by sides, and ATVs largely known for their inexpensive price. These product offerings are all about cheap fun, certainly not for world-beating performance. Kymco brought the SuperNEX electric superibike to EICMA this year in the hopes of changing that perception. Kymco has, in recent years, been expanding its reach in the electric scooter market. It has developed a swappable-battery charging system for riders with a vending-machine-style charge station. It has worked to increase performance and ridability standards across the marketplace. It now produces more than half a million vehicles per year with production facilities in Jakarta, Petaling Jaya, Shanghai, Changsha, and Chengdu. The company supplied the 450cc engines in BMW’s G450 X Enduro, which also served as the optional range extender in BMW’s i3. Kymco is no small player, but superbikes have never really been in its wheelhouse. With electric on the brain, the company wanted to make a splash at EICMA this year, and show that it can be a serious contender. 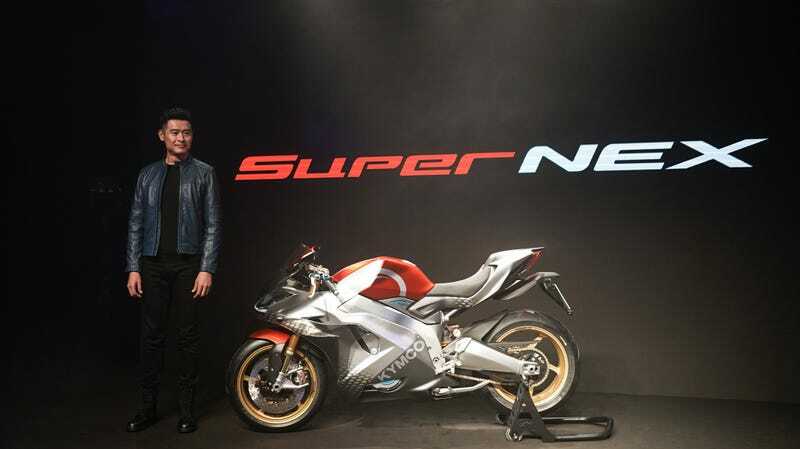 The SuperNEX can allegedly sprint from a standstill to 62 in under 3-seconds, which is as quick as any electric bikes on the market today. The difference resides in the SuperNex gearbox, which retains a foot-activated sequential shift 6-speed. It will continue on to 124 mph in 7.5 seconds, and will hit its 155 mph top speed in just 10.9 seconds, if you’re brave enough. Kymco calls it “fast as a thought”. The SuperNEX also introduces Kymco’s new Full Engagement Performance electronics. From the Kymco press release: “With FEP, riders can always perform a perfect launch. During hard acceleration, FEP ensures there is no wheelie or wheel slippage. During hard braking, FEP prevents rear wheel lifting. When riding through uneven or wet surfaces, FEP provides maximum traction. FEP provides maximum traction. Moreover, the degree of FEP engagement can be adjusted to riders’ preference. Kymco wanted to retain some of the joy of riding an ICE bike, and they’ve done that in two ways. First, by retaining a 6-speed transmission, the bike still offers riders an upshift and downshift connectivity. Admittedly, it’s a little different from traditional, as a race-style slipper clutch allows for no-lift shifting with no clutch lever application. The second way, is by amplification of the electric motor’s natural sound. As you can hear in the video below, the SuperNEX makes quite a bit more noise than you’d expect from an EV bike. I’ve been watching Kymco recently, as I really like their small-engine bike offerings. This superbike, however, is a huge departure for the company, and it has knocked the ball way outside of the park. Sit up and pay attention to this brand you may not have heard of, because they’re making big moves. In fairness, however, there isn’t any indication of if or when the SuperNEX will make production.